The Monster Energy NASCAR Cup Series is headed to Richmond International Raceway for the Toyota Owners 400 and our Sarah Handy breaks down her picks and who you may want to pay attention to this weekend. Denny Hamlin: Richmond is Hamlin’s home track and it’s a track that he has been very successful at. In 23 starts at RIR Hamlin has 10 top-five and 14 top-10 finishes to go along with his three wins. No other driver competing in this weekend’s race has led more laps at the short track than Hamlin (1,653). In his last five starts his worst finish is sixth twice (September 2015 & April 2016). However, that same sixth place finish back in the 2016 Spring race was followed up with a win in the September fall race where Hamlin also led 189 laps. 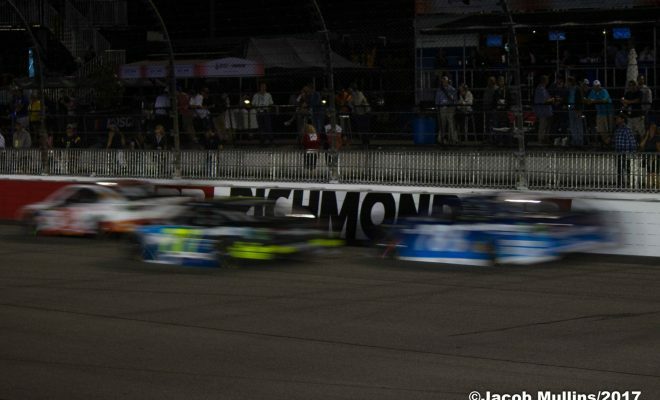 Richmond is the perfect track for Hamlin and his No. 11 team to earn their first victory of 2018. I believe they will do just that and because of his success at the track Hamlin is my number one pick heading into Saturday night’s Toyota Owners 400. Kyle Busch: After back-to-back wins that I correctly called in the last two week’s weekly picks featured, Busch will look to win three races in a row. Busch’s average finish of 7.4 is best among active drivers but he hasn’t found victory lane at RIR since 2012. However, in 25 starts at the track Busch has finished all but one of 10, 026 laps of competition. That stat alone is very impressive. Also impressive are his four victories, and 15 top-five finishes which are also the most among his competition. In his last five starts at Richmond, Busch’s worst finish is 16th which came in the Spring race last season. He hasn’t finished in the top-five since back-to-back second place finishes in September of 2015 and April of 2016. Even though his stats have fallen off a bit over the last few races I can’t count Busch out as a top pick for the third straight week. His consistency has been key, and he’s shown the speed needed to win right out of the gate this season. Martin Truex Jr: Richmond isn’t a track that has yielded the best results for the 2017 Monster Energy NASCAR Cup Series Champion. In 24 starts at RIR, Truex has an average finish of 20.00 and in his last five starts he only has one top-five finish which came back in September of 2016. He also hasn’t come close to winning since that top-five finish mentioned previously. His statistics must take a trip all the way back to 2008 to find the last time Truex had finished in the top-five at Richmond. Luck also hasn’t been on Truex’s side the last two weekends with finishes of 37th (Texas) and 30th (Bristol) both due to crashes. Kevin Harvick: With three wins at Richmond and only one finish worse than 14th in his last ten starts, I wasn’t sure where to put Harvick this week. I may get some grief for having him as a dark horse, but he hasn’t won at RIR since April of 2013. His best finish since his last win at RIR is a second-place finish back in April of 2015 and with him having led a measly 11 laps in his last three Richmond races a win may be pushing the limits. I won’t take away the fact that Harvick has been mister consistency this season racking up three consecutive wins early on and no finish worse than seventh in his last three cup races, so he may finish well, but I’m still going with the tandem of Hamlin and Ky. Busch to dominant on Saturday evening. Ryan Blaney: His four starts at Richmond aren’t anything to rave about with a best finish of 18th coming in the fall race last season. However, for Blaney I must look at his season so far. The young Penske driver is going to win this season it’s just a matter of when. After a disappointing weekend after being crashed out early while leading at Bristol he had yet another strong showing. Blaney led twice for 100 laps at Bristol and is currently sixth in the standings. He has five-top 10 runs in the first eight races of the season and finished third Martinsville, another short track just a few weeks ago. Joey Logano: In his last eight starts at Richmond, Logano’s worst finish is tenth which came back in September of 2016. Since that time, he has finishes of second and first. Logano is the reigning Spring winner where he only led for 25 laps after starting in the fifth position. I’m not sure if Logano has anything for the Gibbs Toyota’s this weekend but I’d keep an eye on him. Richmond is certainly a track he has run consistently at over the years. Who do you think will win on Saturday night? Let us know in the comments below and be sure to tune into the Toyota Owners 400 from Richmond International Raceway which is set for 6:30pm EST on Fox.